Ccleaner Pro 5.51.6939 virus detected "Trojan" "Win32"
Use brain if possible, one unknown AV says Trojan, while other famous AVs detect nothing, that will be false positive for sure. Need to be vigilante though and report all such detections, because remember last year when it was actually infected and back then only one AV/Vendor was detecting it. So strange, on virustotal Avira detect nothing. So any explanation from CCleaner? Online scanners may be using the Linux (or is it Unix) versions of the virus scanners (at least that's what Jotti's Malware Scan does) and not have the same detection the Windows versions have. 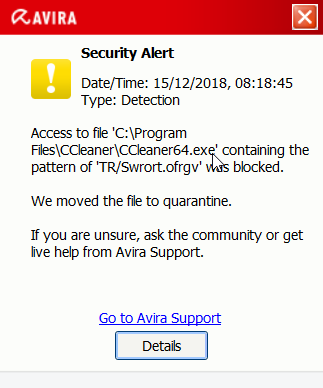 The best thing to do is report it to the antivirus software vendor by submitting the file as a possible false positive, if it's a false positive it won't take them long at all to remove it from being detected. CCleaner v5.51.6939 (13 Dec 2018) is malware. What now?? It isn't Malware., report it as a False Positive. My version was downloaded as normal from download.com. When a new version is released look in the Announcements area of the forum for the version you've downloaded. For the past few months they've been posting the checksums/hashes of the downloads that you can compare against to insure you're getting the actual official files released by Piriform/Avast. See the most recent release announcement located here for an example, it lists the checksums/hashes in the post.